Do Taller Buildings Have to Mean Darker Streets? How to design a denser city without sacrificing sunlight. Nobody, it seems, likes Brooklyn’s Fourth Avenue. It’s a big, busy street — parking on both sides, two lanes of traffic (plus turning lanes). The older buildings are industrial and stick low to the ground. But those don’t get mentioned much. It’s the newer ones that stick out: They rise up tall and glassy, fronts flat to the sidewalk. Their ground floors, mostly spent on required parking, turn cold, concrete faces to people walking by. They’re nothing like the squatter, more pleasant buildings directly to the east, that fill the blocks of Park Slope, from this edge of the neighborhood, up to Prospect Park. On the contrary, Fourth Avenue’s modern wretches are exactly the sort of buildings that neighborhoods like Park Slope fear when developers and policymakers start talking about building more housing. But designers and planners don’t like Fourth Avenue’s buildings either. They often speak with relief about how the parking requirements that made the ground floors so terrible have been changed. “We tend to use Fourth Avenue as a poster child for a lot of things we shouldn’t be doing,” Jeff Shumaker, the director of urban design at New York’s Department of City Planning (DCP), told a roomful of architects at AIA New York in April. “You can see the different experience you have when you’re walking here and looking up.” But, Shumaker and the department he works for are arguing, it’s not the density and the height of the buildings that’s the problem — it’s the design. Closer to the park, on Grand Army Plaza, the buildings are tall, without being overbearing, and big, without ruining the experience of walking down a city street. For decades, the city’s zoning rules have made it harder and harder to build buildings like these. Now, though, the city planning department thinks it has a way to change that — to encourage the design of buildings that will keep streets light and airy, even while allowing developers to add dense housing to a city that needs more of it. For a century, New York’s designers, planners and policymakers have been trying to make sense of an eternally shifting puzzle: how to pack more people into the same patches of land, while still making the city’s buildings beautiful, well constructed and pleasant to live in and around. As part of the housing plan of Mayor Bill de Blasio’s administration, the Department of City Planning has been working on the first serious update to the city’s zoning code since the 1980s. And one big part of the department’s plan is to allow more flexibility in the very shape the buildings take — to “modernize the rules that shape buildings,” with the aim of making the city’s built environment look more like it did in the early 20th century, with more interior courtyards, street-side gardens and airy ground-floor shops. DCP is proposing to make these changes by tweaking the rules for building envelopes. “It’s looking at quantity and quality all wrapped up together,” Shumaker says. In areas of the city that are medium or high density, the department wants to allow buildings to creep five to 15 feet higher in order to accommodate airier floor-to-ceiling heights and ground floors that are either better suited to businesses or lifted from street level for more residential privacy. DCP is also proposing to measure how buildings are set back from the street line differently and update rules for street wall design, so that designers could add gardens or more articulation on the front of buildings. And the department wants to make it easier to build on irregularly shaped lots, by changing the rules for lot coverage and distance between buildings. These changes, the department’s planners argue, will create better quality buildings across the city, without increasing the allowable density in any particular area. Right now, though, DCP is at the very beginning of the process of selling these ideas to communities and city council members. And to succeed, they will have to convince opponents of the plan that these changes aren’t just about building taller buildings. 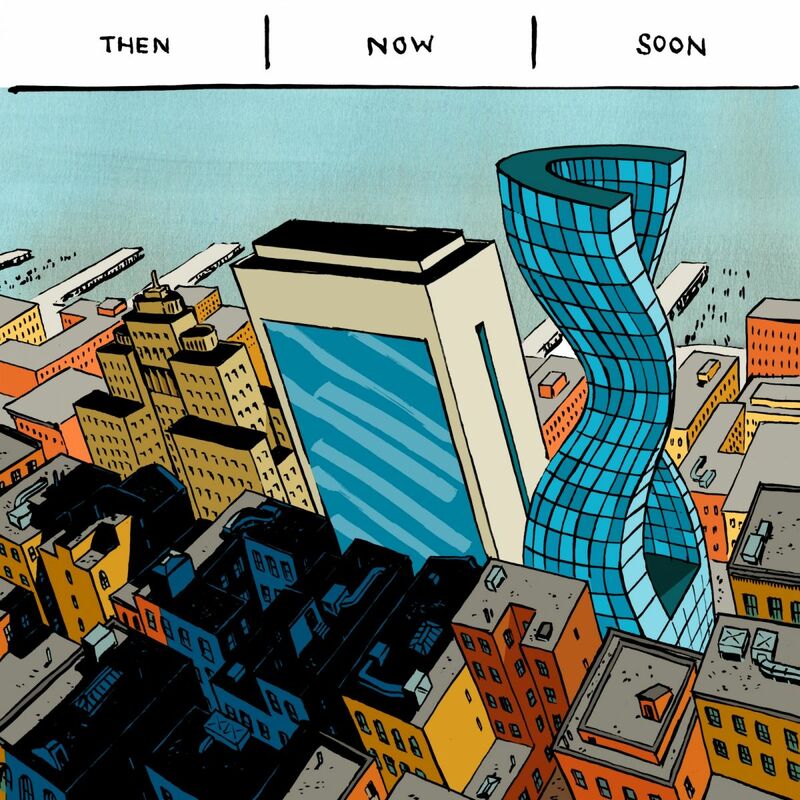 New York was the first city in the country to adopt a citywide zoning code, and since the beginning of its zoning history, the city has been struggling to create rules that balance growth with livability. In the early 1900s, buildings were going up fast and going up tall. Just south of Wall Street, for instance, there are two towers to the north of Trinity Church, built in 1905 and 1907, that stretch 21 stories up (skyscraping, for their time) and flank the tiny, dark corridor of Thames Street. To keep New York from becoming a dark nest of brick and stone, by 1915, the city had convened a commission to consider how to control the shape and height of buildings. In 1916, the city’s first zoning ordinance required that developers keep at least a minimum level of natural light and air reaching the street. Primarily, the way builders met those requirements was by putting up “wedding cake” buildings, with their upper stories backing away, in tiers, from the street line. In 1961, a new zoning code tried a different approach. Buildings that left little open space on their lot were kept short and, consequently, made less profitable for developers. Buildings that left their lots open — tower-in-the-park style developments — were allowed to reach toward the sky. But it quickly became clear that the tower-in-the-park style of building made for terrible urban life and was killing the vibrancy of New York neighborhoods. In the 1970s and ’80s, the city’s zoning rules tried to pull back from that model to create buildings that fit better into the city’s existing fabric; contextual zoning districts laid out building envelopes that would restrict new buildings into similar shapes as the old ones. Three decades later, though, architects are finding that those rules are keeping them from designing buildings that would create the most housing possible and that would actually improve the cityscape. Last summer, research group Citizens Housing and Planning Council released a “Building Envelope Conundrum” report — it covered a series of case studies in which architects could not build to the maximum density they’re allowed by law because of building envelope restrictions. The buildings that went up were packed into invisible lines as tight as shrink-wrap. “We were hearing from architects on our board that it was increasingly hard for them in parts of the city. They were building to the envelope rather than the floor area,” says Sarah Watson, the deputy director of CHPC and co-author of the report. “You hope the floor area is dictating the capacity and density of the city. The other rules were not meant to restrict the potential for new units.” Plus, the architects told CHPC, these restrictions were creating an incentive for developers to squish floor area into a building, which meant they were putting up buildings that were flat at the front and edging right up to the sidewalk line. DCP’s proposal aims to give architects more flexibility than they currently have — to have space to make other design choices than “maximize the area of the building at all costs.” But DCP thinks that, to do that, buildings will need to grow a little taller, in order to lift first-floor residential units from street height, as in older brownstones, or to create taller ground-floor retail spaces. “The changes are very subtle,” says Ginsberg. People might not be able to pinpoint what’s different, even as they feel mysteriously happier walking down the street. “I think what people will notice most is that commercial spaces are more open, with bigger windows.” And, he says, there will be more indentations and variation in facades and courtyards, the sort of entrances to buildings that were more common between the 1930s and ’50s. “I don’t think there’s a lot of sympathy for developers who can’t squeeze every inch onto their site,” he adds. At the crux of this proposal is the question of light and air — the problem that has driven zoning for the past 100 years. The higher floor heights it allows would leave room for longer windows, and some of the tweaks they’re making would allow more windows to let in light on the interior of the building, to kitchens and bathrooms. On the street, more flexibility to set buildings back from the sidewalk would leave more space for pedestrians to breathe. “The proposal is really friendly to light and air,” says Shumaker, who, before taking a position at City Hall in 2007, worked as an urban designer for SOM, the influential architecture firm responsible for many of New York’s landmark skyscrapers including One World Trade Center. But advocates like Berman argue the opposite — that the height increase threatens light and air. And as Michael Kwartler, an architect and planner, pointed out at the AIA event in the spring, the DCP’s proposal doesn’t specifically address street-level access to sunlight. In theory, at least, it is possible to build tall without casting deep, dark shadows on the street. And architects and planners have new tools to play with too. Since the last time the zoning code was significantly updated, simulation software has made easy a previously tedious task: projecting how a proposed building design will cast shadows down onto city. For the tallest, luxury skyscrapers, architects are playing with ideas about how to mitigate shadow. Architecture firm NBBJ, for example, designed a “shadowless building,” the shadow of which was lit by light reflected from a companion building. Designers are playing more with mirrored heliostats, too, to direct light from the outside into the deeper recesses of buildings or down onto the street. Sydney’s One Central Park has an entire solar shelf that redirects light. The DCP’s plan, on the other hand, is tied to de Blasio’s larger vision for quality and affordable housing. The plan has most to do with the quality part of that diploid, but it has implications for affordability too. On a policy level, inclusionary zoning would incentivize developers to build mixed-income housing by increasing the floor area allowed; the DCP proposal aims to make sure that the building envelope restrictions wouldn’t neuter the impact of that policy. But, Shumaker argues, the “quality” part of the DCP’s proposal is also about making affordable housing better. What would that actually look like? In its preliminary sketches, DCP shows buildings with fronts that scoop back from the street and have more vertical variation. And in the next few months, the department will be working with architects to create images that compare and contrast buildings built under current rules and buildings that might have been built on the same sites, under the proposed rules. If the city’s planners are right — if they actually can allow and encourage the city’s architects to build the sort of tall buildings that New Yorkers already love — it might be a way to convince even the most height-averse New Yorkers that more density won’t drive the city into a very dark place. Sarah Laskow is a reporter and editor in New York who writes about the environment, energy, cities, food and much more.